The Georgian Bay Community School Elementary Curling Team ended a successful season on March 26, after the team travelled to Chesley to compete in the New Holland Provincial Elementary School Curling Championship. 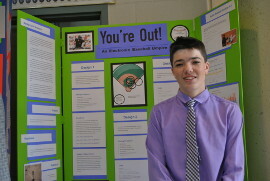 After a competitive and rigorous selection process, Elias Andersen, a Grade 11 student at Pretty River Academy, will represent Canada at INTEL ISEF, the International Science and Engineering Fair, May 14-19, in Los Angeles. 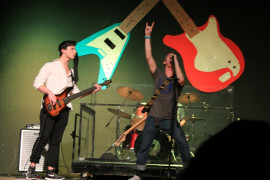 The Battle of The Bands at Georgian Bay Community School in Meaford on Friday night, March 3, showcased the talents of local high school students and provided many of them with their first practical lesson in performance as musicians. The Georgian Bay Community School music room and hallways have been full of talented musicians preparing for the upcoming Battle of the Bands competition this Friday night. Friday, March 3, thirteen GBCS bands and soloists will be showcasing their voices and musical abilities while competing against their fellow participants.